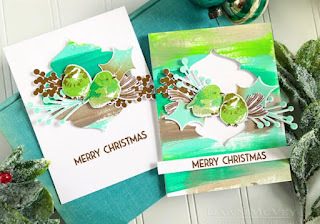 I’ve been on a Christmas card making frenzy, so I decided to make two different cards, although they are quite similar. The first version has a darker brown fawn with a huge floral, greenery crown. 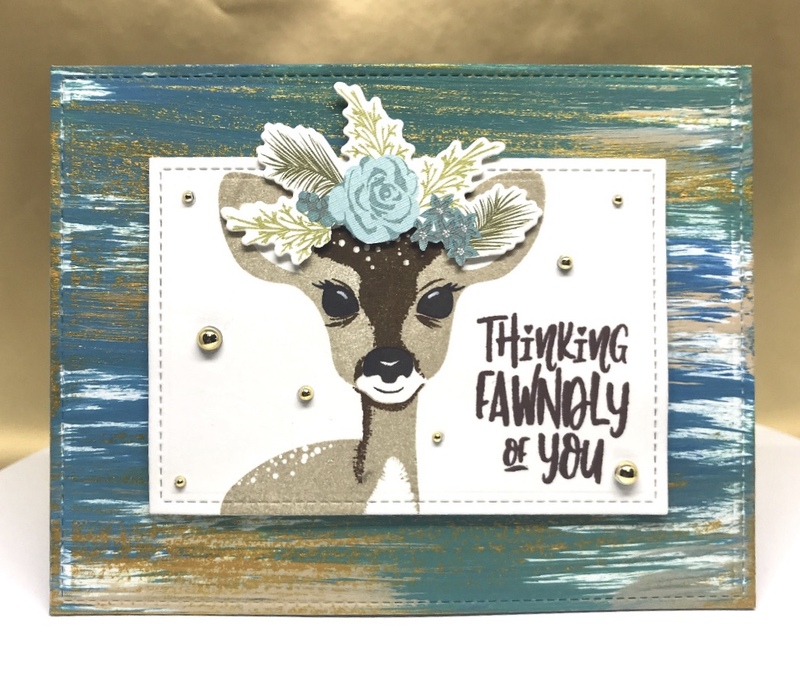 The second card has a lighter, Kraft colored fawn with a crown made from last year’s Make It Market Wonderland Kit. I didn't have an assortment of acrylic paint on hand. I had white, green, blue, and tan. To create different shades of blue, I mixed the colors of paint I had until I got the desired colors I wanted. 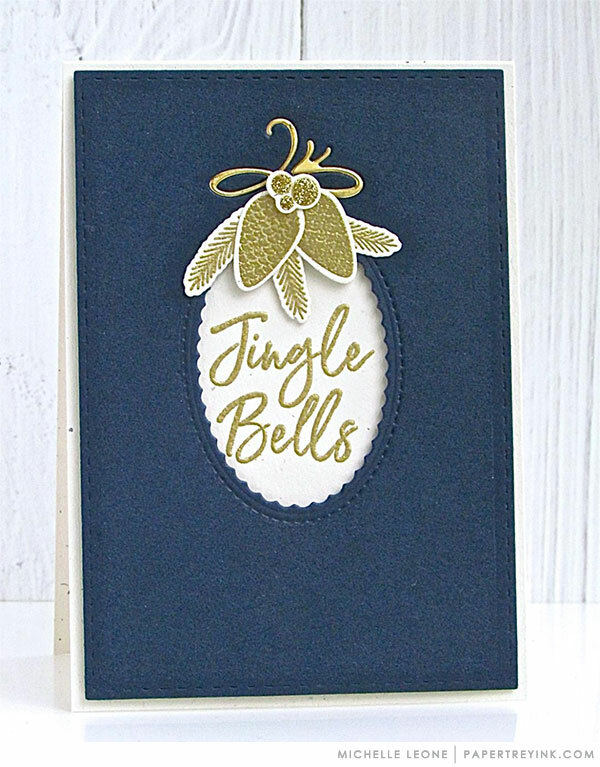 I added gold pearl embellishments to finish off the cards. I love how distinct the brushstrokes stand out and how simple these were to make. Thanks for stopping in and have a great day! It's been a while since I've been able to blog. I always have every intention to blog more often, but life always gets in the way. Most of the time, I find myself fortunate just to have enough time to run to my craft room and get some stamping done. I'm delighted to share this card with you today. I used Laurie's technique but also added some Mica Flakes on my gilded leaves to give them some dimension. I love this time of the year and the excitement of the upcoming holidays. 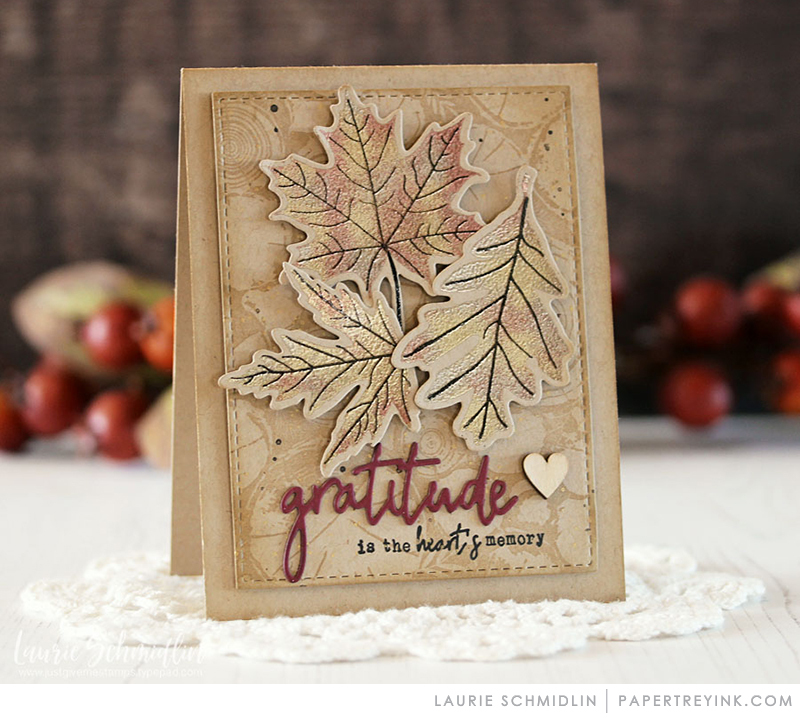 The background was created with the Text & Texture: Leaves Stamp Set. It is definitely quickly becoming one of my favorite background stamps, and I am sure it will be versatile to use year round. 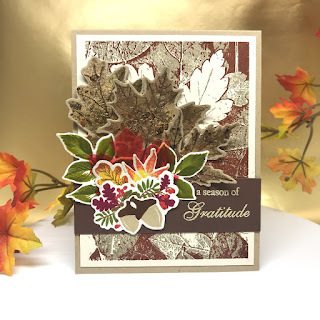 The faux gilded leaves were made with Leaf Prints Stamp Set and Leaf Prints Die Collection. 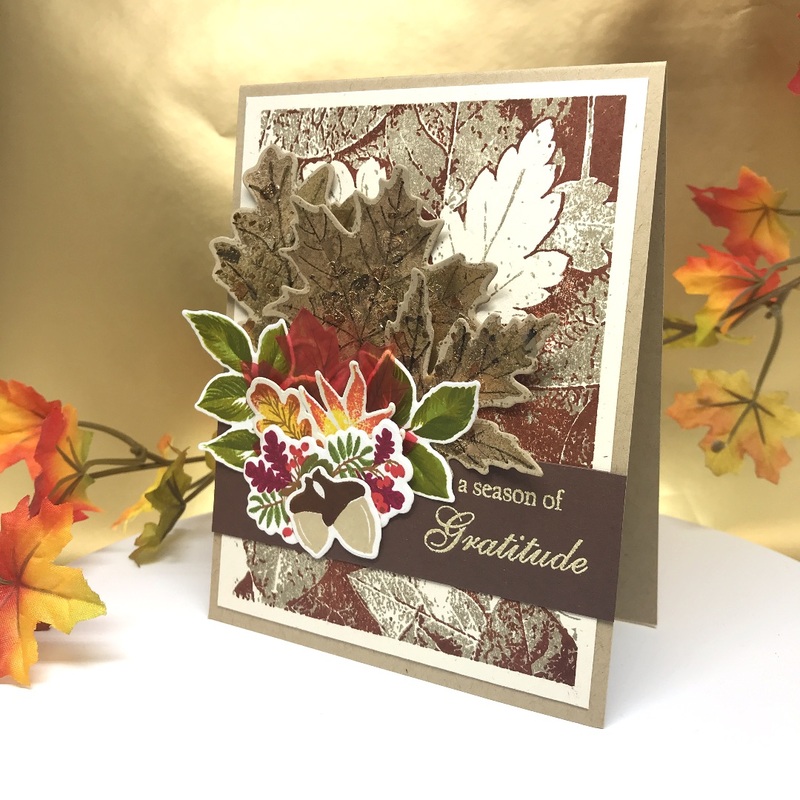 I used Altenew rose gold, antique gold, and copper crisp embossing powders and some Stampendous Mica Flakes on the leaves. I added a translucent maple leaf note on top of the gilded leaves. This came in my Hero Arts kit for this month. 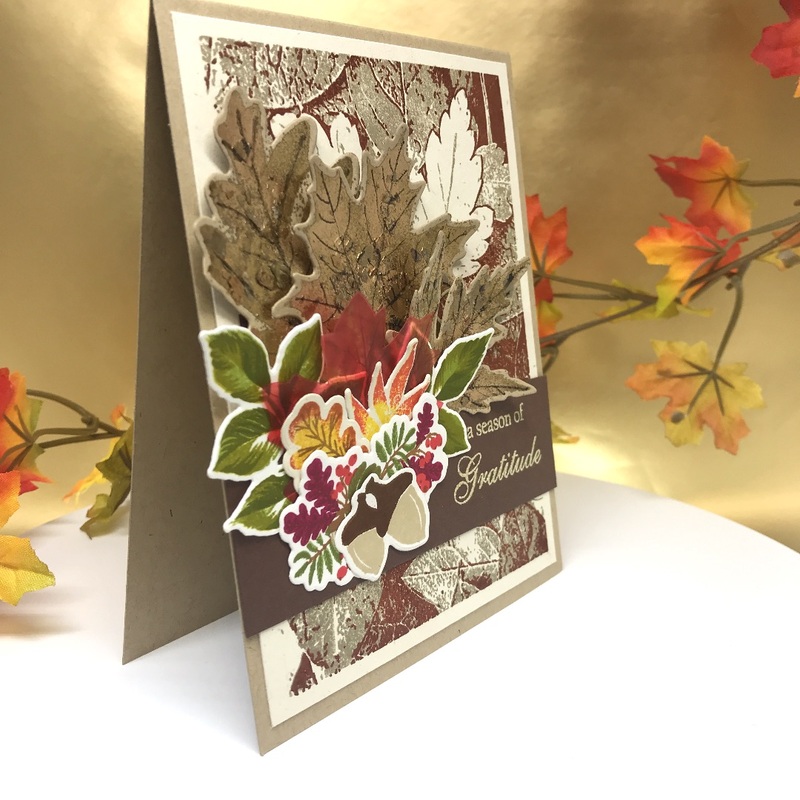 I also made some leaf accents from Build a Flower: Rose Stamp Set and added images from Seasonal Borders: Autumn Stamp Set & Stencil. 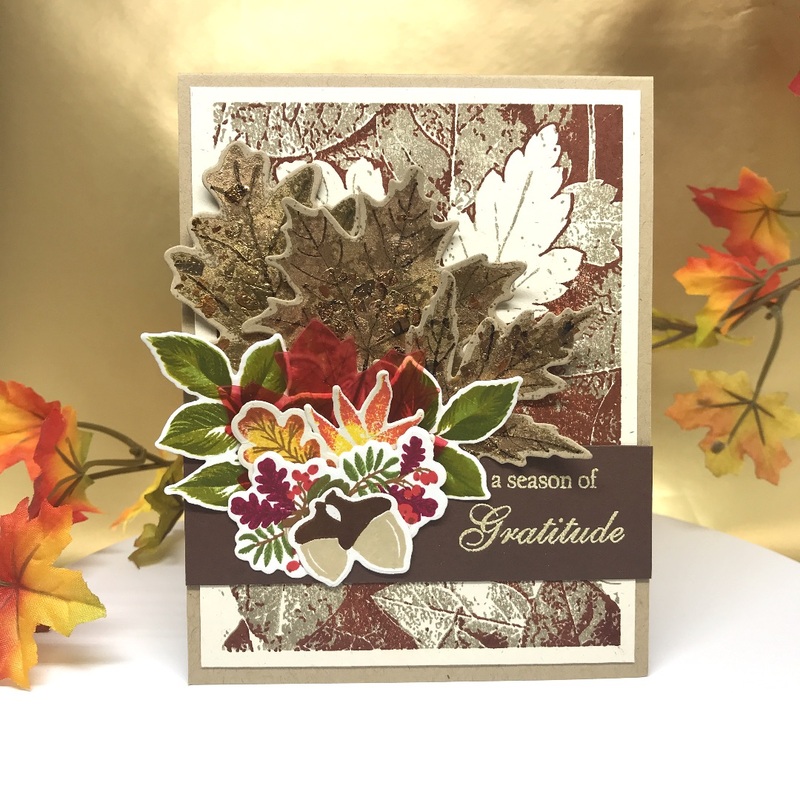 The sentiment was from Fall Elegance stamp set; unfortunately, this set is a retired Papertrey Ink set and no longer available. I love how this card turned out. Hey all! For Christmas, I always make gift baskets for my children's teachers. I try to show my appreciation for these special people who spend so much time with them. I think because I used to be a teacher, I understand how important a role it is to be in the lives of these little people and influence them positively so that they may grow up to be productive, empathetic, and respectful human beings. This is just one of the many things I put in the gift baskets. It's been quite busy here at the Phul Household, and my crafting room's being put to a lot of use. This year I made these little gift bag holders that fit three Ghirardelli chocolate squares perfectly. To create these, I made the bags with Favor It Box 3 Die. The greens and berries were created with the Holiday Greens Stamp Set, the Holiday Greens Die, and the Golden Garden Stamp and Die Bundle. The little "Holiday Sweets" tag was made with a sentiment from the Friendship Jar Holiday Fillers Stamp Set and the Jar Label Die. After adhering everything and adding the Ghirardelli squares inside the bag, I tied the top with a ribbon and attached the tag to it with a piece of green and white twine. I'll try to post a picture of the finished baskets when I complete them later on this week. First I used Tumbled Glass Distress Ink to blend around the edges of a watercolor paper measuring 4 x 5 1/4 inches. Then I stamped the large and small flower images from the Persian Motifs Stamp Set with VersaMark Ink and embossed it with Wow White Pearl Embossing Powder. Next I used a sentiment from the Scripted Stamp Set and stamped it in Versafine Onyx Black Ink. I heat dried it because this ink tends to take a while to dry and I didn't want any smudging. I used various colors from the Kuretake Gansai Tambi Set to watercolor the flowers. I layered the watercolor paper on top of a 4 1/8 x 5 3/8 Sweet Blush cardstock and then placed it on a Classic Crest Cover Solar White card base. Hope you enjoy this card today. It 's Make It Monday time over at Papertrey Ink. I love how they've been making all their Make It Monday challenges around the holiday theme. In this week's challenge, Lexi Daly shows us how to make photo ornaments. 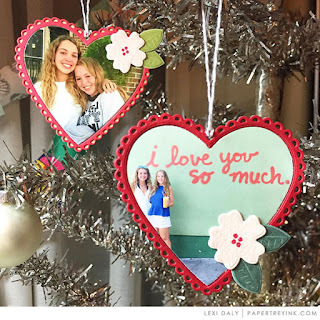 It's a great idea to make your own ornaments and add that personal touch with photos. I couldn't just make one ornament since I have three children, so I made three ornaments- one for my each of them. I used the oval tag base from the Make It Market: Wonderland Kit to create my ornaments. I used my children's school photos for the ornaments. I have so many wallet sized photos of their school pictures. Don't you always have a ton left over and don't know what to do with them? Well, now's a perfect time to pull them out and make some ornaments with them. For my daughter's ornament, I die cut three of the oval tag base from red card stock and also die cut my daughter's photo with it. (The photo was narrower than the oval tag base die but it didn't matter because I only needed the inside stitched oval part, not the whole base with the scallop.) After die cutting all the pieces, I cut the photo down by just cutting on the stitching all the way around (basically cutting off the scallop edge). Then taking two of the red die cuts, cut the middle out by cutting right inside, next to the stitching. 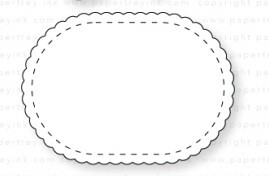 For this, you are basically making the frame, so you want only the scallop and stitching edge and not the middle part of the die cut. I made two of these because I wanted to make the frame a little thicker. After cutting out the two red frames, I glued them together. For the assembly of my ornament, I adhered the photo inside the third red die cut, placing it right in the middle. Then, I added the red frames on top. I punched a hole on the top of the ornament, added red and white twine as well as some silver thread. Then I added a silver sequin and placed a pearl inside the sequin. I also added tiny pearls around the scallop edge. My other two ornaments were created the same way, except I skipped the scallop edged pearls and used different papers for the frames. For one of them, I used the Birch wrapping paper from Pier 1. For my last ornament, I used the pattern paper that came with the Wonderland Kit. I think they came out really cute and can't wait to hang them on our tree this year, as soon as I can get it up. Thanks for stopping in everyone! Have a Happy Thanksgiving! Hi there! So today I got to play with the Sun & Moon Stamp Set from Papertrey Ink. Can I tell you how pretty this stamp set is! It's a gorgeous set and not too expensive either. My first thought was definitely to watercolor. I have two beautiful, twinkling cards for you today. The background paper is watercolor paper and I wanted to create different shades of blue for the background so I used some blue shades from the Kuretake Gansai Tambi Set to watercolor it. For the 1st card, I also splattered some yellow gold watercolor from the Kuretake Gansai Tambi Starry Colors Set. I stamped the moon and sun images with Versamark Ink on watercolor paper and embossed it in Wow Opaque White Embossing Powder. I used watercolors from both sets to watercolor the images. 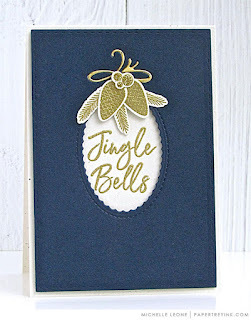 I also stamped and embossed the sentiment in gold embossing powder on vellum. I placed everything on the watercolored background and added a few die cut stars. 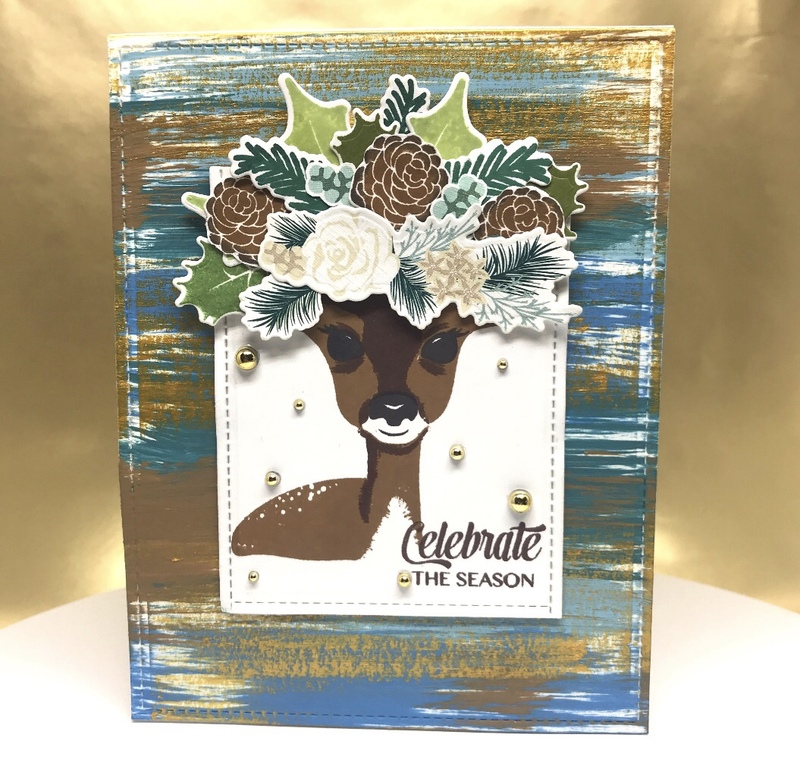 For the die cut stars, all I did was watercolor yellow gold on water color paper and used the Hero Arts Star Confetti Die to die cut the various stars. For the 2nd card, I also used the same process as the first card in watercoloring the images and using the die cut stars on the background. I stamped the sentiment with black ink on white cardstock and die cut some gold stars with the Small Sketched Stars Die to put on the sentiment. Hope you enjoyed the cards today. Thanks for stopping in! Hi there! 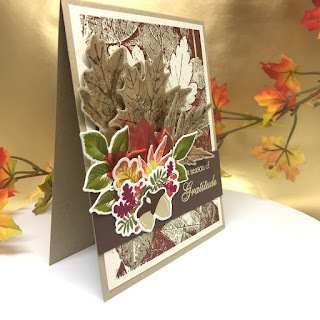 Over at Papertrey Ink, they are having a release week challenge to create a card using one of the cards the team created during the release as inspiration. I love the window dies released this month. The talented Michelle Leon created a beautiful card using one of the window works dies. I used her card as inspiration. I don't have the window dies yet, but decided to create my own window die with a scallop and a circle die. First, I cut a piece of 4 x 5 1/4 water color paper. I did a light wash with Tumbled Glass Distress Ink and heat dried it with my heat gun. Then I pulled out the Kuretake Gansai Tambi Set and used No. 32 (Red), No. 36 (Wine Red), No. 51 (May Green), No. 55 (Green), and No. 91 (Blush Gold) to splatter some colors. I did one color at a time and heat dried each color before moving on to the next. For my window creation, I used my Scallop Circle die and the rubber pads to emboss the scallop die onto the water color paper. Then I used a Circle Die to cut a circle within the embossed scallop to make a window. On a seperate watercolor cardstock with the same paper measurements, I traced the circle cut out from the first watercolor paper onto the second watercolor paper to determine where I was going to stamp. I used the small poinsettia from Year Of the Flowers: Poinsettia Stamp Set and stamped it into the drawn circle with Versamark Ink and then embossed it with Zing! Gold Metallic Embossing Powder. (This is my favorite gold embossing powder. The gold looks rich and bright, perfect for the holidays.) I water colored the poinsettia, gold embossed the sentiment "Peace & Joy" from the Beautiful Berries: Winter Stamp Set, and did a light wash with Tumbled Glass Distress Ink. 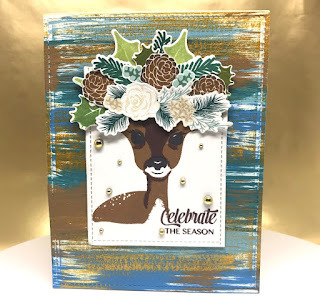 Using Altenew's Golden Garden Stamp Set, I stamped, water colored, and die cut several images. I placed these around the poinsettia and the traced watercolor paper with the image. 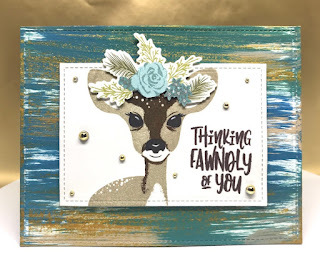 I used double sided foam tape to adhere both watercolor papers, layered it onto a gold card stock, and then placed it on a Pinefeather card base. I added a lot more things than the original inspiration card but I like the way it turned out. Hope you enjoyed my card for today. Hi! I'm Hlee and welcome to my blog! I enjoy creating and designing cards, scrapbooking, sewing, and crocheting. I truly love paper crafting and It is absolutely one of my favorite things to do. I can't wait to share all my projects with you on this blog! I hope you can create with me and join me in my crafting journey.